When Sacramento police arrested 84 people in East Sacramento on March 4, however, the demonstration was far from a riot, according to Dronme Davis. Davis is an American River College student who works with the college’s Universal Engaging Inclusive Transformative Education (UNITE) group and was one of the 84 arrested while protesting Sacramento District Attorney Anne Marie Schubert’s decision not to charge the two officers who shot and killed 22-year-old Stephon Clark in March 2018. Since the arrests, Schubert has dropped the charges against those arrested but protests have continued. On March 7, hundreds of high school and college students staged a walkout and marched to the capitol in protest of Schubert’s decision and in support of Assembly Bill 392, which would redefine when the use of deadly force is justifiable, according to the bill. Davis said that the arrests on March 4 were totally unexpected, as demonstrators were moving away from police, mapping their way home and heading collectively over a freeway overpass. Their chants had died down, and they believed any confrontation they were going to have with the Sacramento Police Department was over, Davis said. Within seconds chaos ignited and 84 people, three of who were members of the press, were blinded by hundreds of riot police who had corralled them onto the bridge, surrounding them on both ends. Kauba is a pre-nursing major at ARC and works alongside Davis in UNITE Kauba said that she had expected riot police, especially during demonstrations that are smaller and have fewer non-white people, but she couldn’t imagine that everyone would be arrested. The ongoing protests are part of a series of demonstrations organized by Black Lives Matter Sacramento and other groups since Schubert’s March 2 announcement that there would not be any charges filed against the officers who shot and killed Clark almost a year ago. 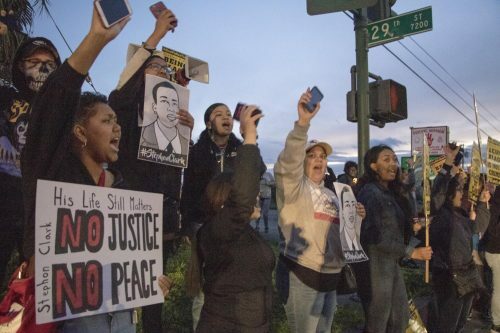 Clark’s death ignited multiple protests across Sacramento last year, adding to a nation-wide series of protests against police brutality and racial profiling against black people. Schubert declared the shooting justified after she said the DA’s investigation found that the two officers believed Clark was armed with a gun when they confronted him and chased him into a backyard last March. Investigators later discovered that the officers had mistaken an iPhone for a weapon, according to the report. California Attorney General Xavier Becerra announced March 6 that his office would also not be charging the officers. Davis said the March 4 protest started off like many of the others that week. “There was tons of faith leaders there with us, and like children and elderly people. Everyone was just singing and walking and holding signs and it was the normal thing,” she said. According to a press release from the Sac PD on March 8, the protest was peaceful at first but then escalated. Protesters reportedly blocked access to a hospital area, there was an argument and assault involving a homeowner, reports of cars being keyed and police observed a person holding an object that was on fire. The demonstration was ruled an unlawful assembly at 7:20 p.m. and protesters were ordered to disperse multiple times over the next hour and 40 minutes — at which point some did. While Kauba said that there were police around most of the night, it was around 9:30 p.m. that armed riot police arrived and blocked off intersections, cornering the protesters in a Trader Joe’s parking lot in East Sacramento. According to Davis, remaining protesters formed a line facing the police and after a moment of prayer, they listed their demands to the officers, which emphasized firing the officers responsible for Clark’s death. Officers started physically forcing protesters back, Kauba said, showing little resistance. The crowd began to head toward a freeway overpass, which was the only direction they could go through the police’s blockades, when Davis, Kauba and 82 others — journalists and faith leaders included — were detained one by one, handcuffed and sat along the sidewalk for hours. “In the interest of community safety, protection of property and after multiple requests to disperse were made, officers proceeded with an orderly arrest process,” the Sac PD press release said. Davis said that while she was was told by officers that night that the arrests were planned days in advance. “I think they had decided weeks ago that this was what their tactic was going to be. They had been preparing this for ages. We all knew that the verdict was going to be not guilty,” Davis said. Kauba said she believed that Sac PD intended to send a message, but wasn’t sure that officers had planned to arrest that many people. Kauba said the police did not have enough zip ties to detain everyone, they had no system to book everyone, and that she could hear arguments among the officers. Both Davis and Kauba participated in the initial protests last year, which were considerably larger and had fewer arrests. In the weeks following Clark’s death, hundreds of protesters blocked Sacramento Kings ticket holders from entering the Golden 1 Center as well as blocked rush hour traffic on Interstate 5, according to the Sacramento Bee. “[N]one of those (demonstrations) were like militant or anything like that but if I were expecting to be arrested, it would have been there,” Davis said. Kauba and Davis both say they believe the police are upping their aggression to prevent a situation like the famous 1992 Los Angeles riots, which lasted for five days after four officers were acquitted for the use of excessive force and beating of Rodney King. “I think their response to everything following the failure of DA Schubert to indict the officers who shot Stephon, has been anticipatory and they want to prevent a Rodney King situation from happening, so I think that’s why there’s this huge show of aggression and force,” Kauba said. Despite the alleged intimidation tactics from Sac PD, protests and marches have continued every day since. 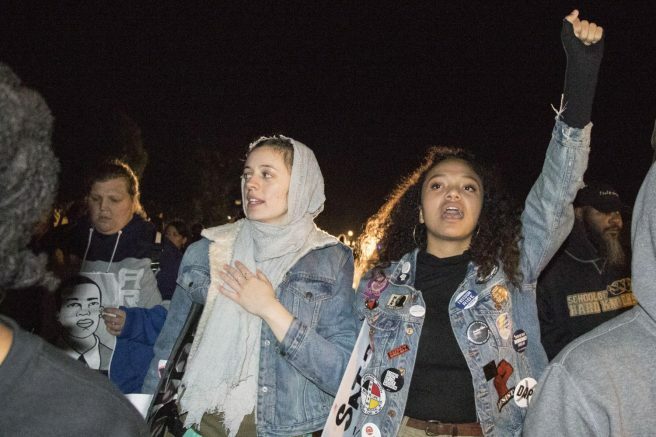 On March 7, a walkout and march protesting the DA’s ruling and in support of AB 392, led hundreds of protesters from Sacramento City College, to Sacramento High School and ended at the California State Capitol, according to the Bee. Quoting Martin Luther King Jr. in the Hub only three days after her arrest, Davis agreed that protests are the only way for unheard and marginalized voices to be acknowledged. Although she says knows that firing the officers responsible for Clark’s death wouldn’t solve the larger issue, and passing AB 392 won’t always protect every person involved in police confrontation, Davis says BLM and other advocacy groups will continue to protest to draw attention to problems that have been ignored for too long. Be the first to comment on "Students among 84 arrested during Clark demonstration"